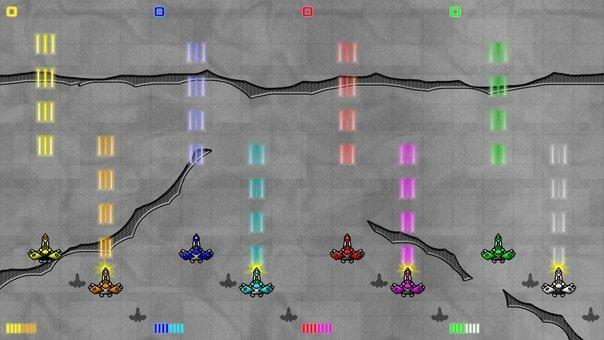 Well… As promised yesterday, here I am to write about my upcoming MiniGame in 2-D. The map itself remains unnamed so far, not sure what I will call it, but I’m pretty sure it will start with MG_2D_ and if more mappers start doing other maps using my system I would suggest them to stick with the formula. There are really many possibilities, and even if I’m not going to explore them all, I hope other mappers will… As soon as I release the first MG_2D_Beta for everyone to play and test, I will explain (and release a .vmf if necessary) exactly how it works (even if I know many mappers already decompiled the Alpha version) and explain the things they need to take care with. 8 Friends playing a Fighters game at once! Awesome!? I can se a lot of future in some of those ideas; however not sure how many will be able to support 40-Players. Also, some of those may require Game-UIs wich I’m not using in my platform game for many reasons (including lag, possible crashes, and that I don’t think it’s a good idea to add so many Game-UIs since I’m making the map playable by up to 64 players at once (even if I don’t personally recommend going over 40). SackBoy from LittleBigPlanet may be the basic choice for players. I have however decided how to do almost everything now, and as I post this I’m gonna get to work. Will start trying the new ideas for the “engine“, and if they work correctly, start mapping right away. I don’t know when a real final version that I think it’s worth being called “V1” it’s going to be released… But I’m planing on getting Alpha 3 or Beta 1 ready as soon as possible so you people can start having fun with it, give feedback and test if there are any bugs or problems with the “engine” that couldn’t be spotted just in a few testing rounds. On future versions I would like to have only good-quality courses (having some standarts and minimum values), having lots of them (maybe using Propper and “SmartMapping” I can fit up to 50-100 courses on a single .bsp) and I want them to follow some kind of storyline (very basic stuff). Also, there will be tons of courses, models and achievements locked. Like “You need to do Course X to unlock Course Y“, and you need to defeat “Bullsquid Boss” to unlock “Bullsquid Model“. Those unlockable features will be saved by the map and remain unlocked until the server resets (the server doesn’t need to reset for a week? your advance is saved the whole week!). I may chat in the future with some MG_Server owners, and maybe we can figure out a way of saving progress between server-restarts, but don’t count on that… And that’s still too far away anyway! The idea is that someone (the first one that got to X point, like on most MiniGames) will be “The Choser“: the one chosing the course for that round. He will have many buttons available that lead to the courses, but he will be able to press only on function of what’s available in the “World Map“. Players will be able to decide (with more choices that the ones seen in that example paint picture) what paths to take, to clean every single level to unlock all the models, rush to the end, or try to avoid that specially hard level. This system will also include a “Random Selection” available on button AND that will automatically get selected if the player who is chosing takes too long (or do you prefer to have all the time needed to choose and discuss?). The Random Selection will always select a “Red Course” (available and not beaten yet). I may ask for some help at some point in the new future. Right now I can think of doing re-skins for Sackboy and maybe other models. So if someone is somehow skilled skinning and is up for making some, just let me know. As a last picture, here are some of the models I have at my disposal right now. I accept suggestions (as long as you give link to a valid model, like those on Garry’s Related Files or similar webpages), including better versions of the models. I’m completely ignoring all the “You should look for…“. Some of the models I have got so far for the 2D MiniGame. And those are some I thought about but couldn’t find a nice model, or the model wasn’t working: Pikachu, Boomberman, Megaman, Toad, Princess Peach & Princess Daisy, Meta Knight, Koopa Troopa and Donkey Kong & Family. I have also alread spotted (but not downloaded yet) some interesting models like Meatboy, Invader Zim and the Pukui Family. Take in mind that not all models will make it to the final cut, and that I may starting adding only 1 or 2, since I’m planing on making about 5-7 animations per model. Also, some nice working models may get ignored if they give problems animating or recompiling. No more Minas Tirith’s news!? MG_2D_Unnamed info comming tomorrow! Hannibal is already working on the final stages of Minas Tirith, detailing, animating some models that need new animations, fixing and improving things, chosing the songs and pacing them with the map and what’s going, making the Levels-System… Don’t take me wrong, there is still a lot of work to do until Minas Tirith is done, but he is getting there. He mentioned to me that he may give some little more info, like a list with all the songs he is going to use or things like that… But we promise nothing. The guy just wants to work on the map, make it as good as he can, keep as many surprises as he can and release it for everyone to play and enjoy! However, I had already received a couple of courses from other mappers, and I have word of a couple more doing more courses… So I hope I can put together the final alpha version (03) or first beta really soon so all servers willing to do so can play and test it, and give me input or spot some problems with the system itself. So see you tomorrow if you are interested, and good night everyone! Minas Tirith info delayed. Some info on the MG 2D. EDIT: Added a screenshot and a Youtube video. Well… I’m sorry but at the end we couldn’t post today about Minas Tirith.. The main (and only) reason it’s because Hannibal couldn’t get the free time needed for making a proper post. He had some work to do with classmates, and he is still working on it right now (midnight in Spain). I can post some little info, but you will have to wait for Hannibal for the real deal with more accurate information… I hope we can write about it tomorrow. Sorry! From what *I* know; Minas Tirith (the physic layout) it’s complete. Some parts are not as detailed as Hannibal originally wanted them, but since the map is huge, and works alone on it, he can’t spend that much time detailing everything. Most of the special items (almost them all) are already made aswell. So now Hannibal is working mostly on the final mapping stage (the main triggers and events), and he his having fun while doing so after so many weeks (or months) of only mapping brushes. We don’t have (neither me nor Hannibal) an estimated release date for Minas Tirith so far; but yesterday Hannibal mentioned to me that he believed the map to have like “15 Hammer Hours left” until being done… This might be wrong, or more work may be needed if bugs/glitches/leaks/etc are spotted on the closed tests. Also please notice that Hannibal can’t work 5 hours a day (or even all days for that matter) on Minas Tirith because many different reasons. We don’t know neither what the size of the map is going to be. Yesterday mention of it was just a joke. However it may end being really big (more than 100 MBs for sure) since it gots many models, customs textures, will include lots of musics/sounds and its a pretty damn big map. 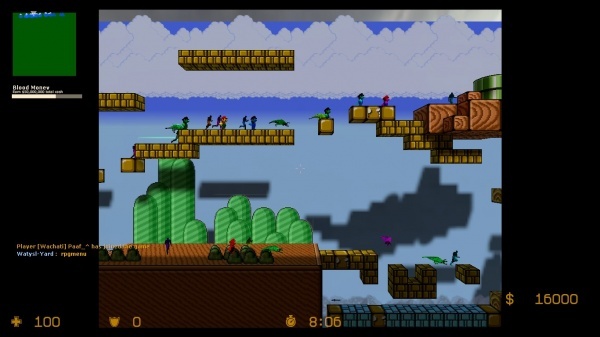 Screenshot of a Test game going on. Now on my 2D MiniGame… It’s going good. Really good. So far I see my new policy of “Make it work, release. Don’t detail or do it later!” working. Since it has been only some days and I got already something to show for, instead of another non-playable-test dead on my maps folder. With the help of Paul we just tested the Alpha Version 002 this afternoon on SteamGamers TestServer. We invited many people and we went up to more than 33 players (dunno exactly how many) and the “engine” works better than what I thought. To be honest I was expecting it to crash at some point, or people getting the camera bugged a lot; none of this happened (even if a couple of people got the camera bugged a couple of times). So far the biggest bugs seemed to be on my part making something wrong, and the camera worked fine all the time. Also, there was no Lag nor FPS Drop (with the exception of when massive Teleport and massive Push were affecting 20-30 guys in the “Jail”, wich is fixable) and looks like the game will be on Beta status soon. Main difference between Alpha and Beta being that Alpha only included fast-made courses (and just a couple of them) to test if the engine worked; while the Beta will start to be a real MiniGame already that would be possible to test/play on any MG server that decided to include it. A half-dozen mappers asked me if they were allowed to make their own courses for the map, and so far every course will be welcomed, specially now that there is none! I may include specifics about it at some point, but nothing is decided yet… I may add a section on our forums to report bugs/ideas of the MG 2D Map and Minas Tirith when they are released. I must admit it was a little chaotic with 33 guys running around (specially the round when most of us decided to get all the Green Bullsquid Model, XD) but was tons of fun, and will be even funnier (I hope!) on future versions. Also, there were only 3 available models, but on the future there will be more (and maybe extra things) to tell you apart from the other players. Silly me, I didn’t even thought about making a single screenshot… I know however some people were recording Videos and/or Demos, and probably some of them took screenshots. If you are one of those guys, please comment here or link me on Steam so I can add them to the blog. I think Paul got a demo of the round with 20 Green Bullsquids running around! MG 2D (Unnamed) is going good! ZE_LOTR_Minas_Tirith almost done? EDIT: Here you go! A video just so you get an idea about what the engine is about (if “2D” was really hard to understand for you). Please take in mind that its just a test course, not the real deal. Players in the video are Kaemon, Hannibal and Luffaren. So the other day I already tested the first alpha version of the 2D MiniGame (wich remains unnamed so far) on an online server with 3 other players. Some minor problems were spotted, but I have solved all of them already and now I’m trying to improve a little the system in general before the second alpha-test. Take in mind that it’s still on alpha status, because I’m working on the “engine“. Right now there is only a short course (so people had something to do) that was Copy-Pasted from the one I made when I was first trying to create the “engine“. The first Alpha Version only included one model, but you could choose between 2 animations and many colours. The idea is to have at least 8 models and 10 colours for the first Beta Version… Still, I’m going to need to make multiple visible paths at once or wide roads to avoid some of the chaos of having 40 people jumping arround in the same 2D-Game at once. Hannibal has been working non-stop on Minas Tirith since he finished his last college projects and the whole physic map is done already, aswell as most of the special items. Hannibal is now adding the triggers and he hopes to finish the map really soon! “I had been running 15 minutes non stop!“, “It took me 12 minutes to fast-check half of the level“. And yes, the map its huge indeed. Let me remind you that not only its made for 4 different rounds (you advance to Level 2 after humans win Level 1, etc) but most of the time you have a couple of routes (at least) to choose from! We don’t know when the map is going to be released… But Hannibal is working non-stop to make it as soon as possible! I may edit today’s rant later and add a video of the Alpha Version of the 2D MG. Not sure. Basically its just your average 2D-Game, nothing special so far. The fun will come from playing it with more people and the design of the future real courses. What is Kaemon up to? Hello everyone once more. Today I’m going to talk a little about my projects and, hopefully, their future. Many of you who read this know me to some degree, others don’t. Those closer to me, specially other mappers, have seen at some point many of my “test maps”. Basically, I come with some special and very different idea, and try to make it possible within the source engine (using Hammer, I don’t know to program), and I start creating it. But as soon as I see I “solved” the problem and I see its possible to make, I lose the interest on it, or making a whole map that uses it. Right now, my “Project J” (a ZE map, you can see what I said about it on our Archives) is completely frozen; I don’t feel like mapping it right now; but I still hope end going back to it someday. Instead, now I’m gonna try to release two MG (Mini Games) maps; and I’m being helped and supported by Paul from Steam Gamers (which many of you may recognize as creator of more than a dozen MG_ maps) with one of them (using the 2D-System) and we hope being able to release the first Alpha Version really soon. The camera has giving me some problems on multi player, mostly because it was designed for HL2 single player; but I think I managed to overcome its flaws with some workarounds, and even if it’s not going to be as good as originally planned, it should make the map both playable and enjoyable. One of the early test of the 2D Mini Game. The other MG Project I want to release soon (I have plenty, but this seems the most doable and realistic) its a Fighting Coliseum. I always liked mapping coliseums (I made already 4 different coliseums for Paranoid versions, and around a dozen for myself, also please note that the released Paranoid coliseums were all “destroyed” by Hannibal due to the brushes limitations, since we weren’t aware of Propper back then), and I also love monsters and to create them and their attacks (I downloaded almost every single monster model available for Source)… So a Fighting Coliseum sounds like a perfect plan! 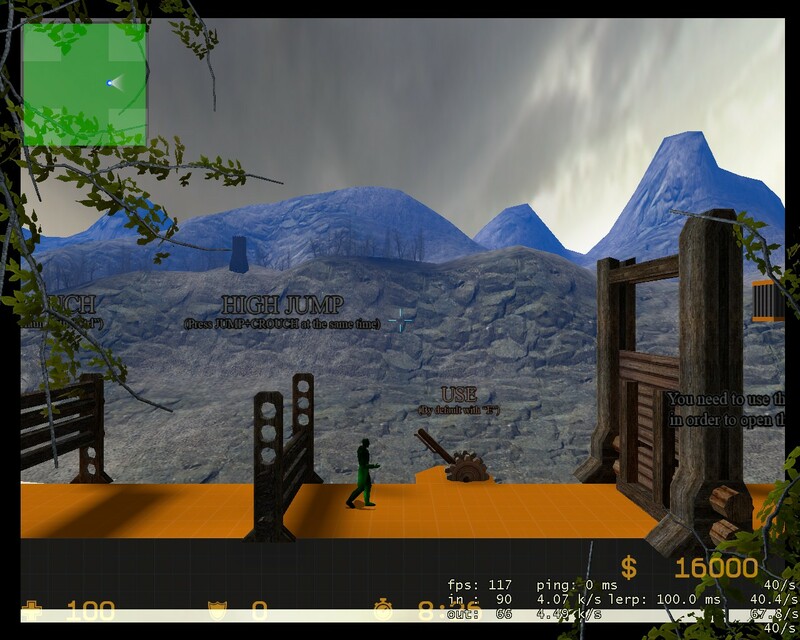 I always wanted to make this map, but it wasn’t until some weeks ago, that I saw the MG_Warmcup_Arena. If you remember, was also this map that made us investigate further on the causes of High-IN causing lag online, which evolved in the great discoveries mentioned in this article: Good News Everyone! So I decided I could make something better in a couple of hours, and I’m gonna try it! Note that it was used in a different context, but it can be applied in my opinion to almost everything… So I’m gonna try to do that. I will do a quite simple coliseum, and maybe just a couple of simple enemies to fight (first version may be boring? )… Then I will release so people can start playing it already, and keep adding details and more complicated enemies (which special attacks and Game UIs). On the long-term I want to have lots of possible monsters/enemies to fight; random layouts; maybe more than one single coliseum, and make it so you can play Player vs Player (1-5 random selected humans controlling the monster/s of the round) or Player vs IA (with some “intelligent” monsters; that follow players and react to them). So… I’m off right now to see if I manage to completely fix the 2D System; and if I don’t slack nor get further problems, an Alpha Version (to spot new problems when playing online with many people in a real server) could be released this night… Even if it’s not fun to play because the path course it’s just something simple for testing.